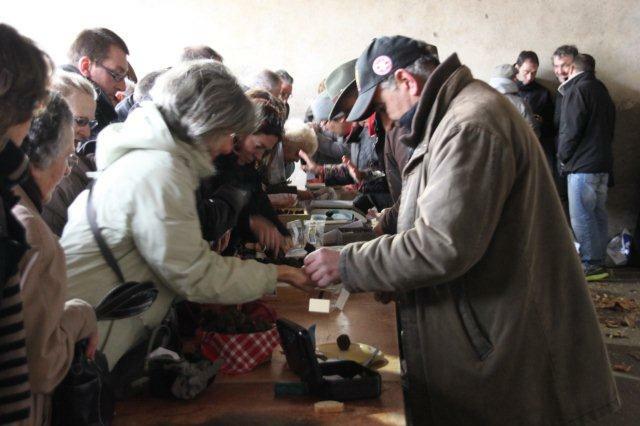 On a blustery and cold Saturday I braved the elements for a trip to Talairan in the Corbieres hills for a truffle market. 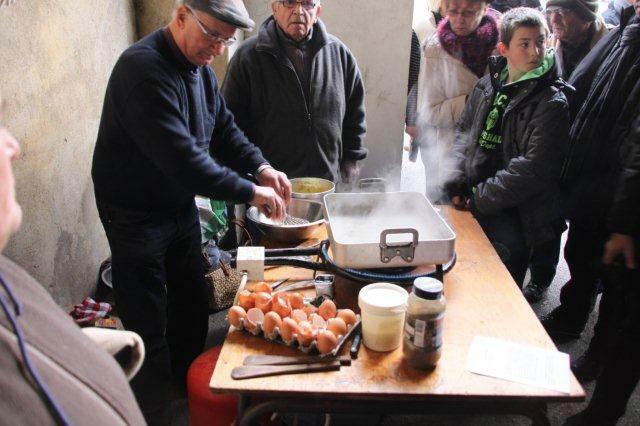 The weather got worse the closer I got, and my heart sunk when it started to pour – would anyone be there, would there be a marche du terroir or would it be a total wash-out? After another 10 minutes drive the sky looked a bit brighter, and the rain slowed to a fine drizzle. 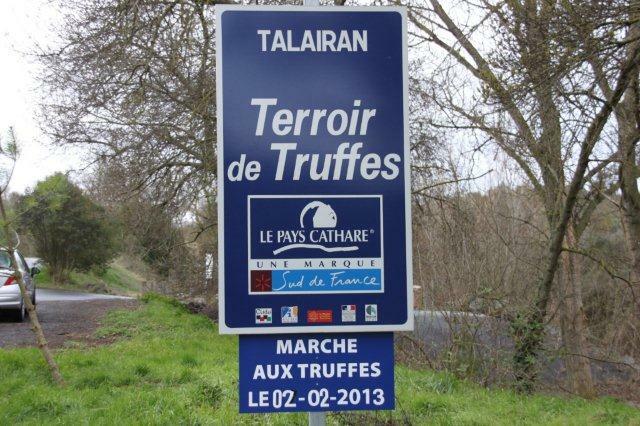 I’d not been to Talairan before, but it was easy to find where the truffle market was taking place. 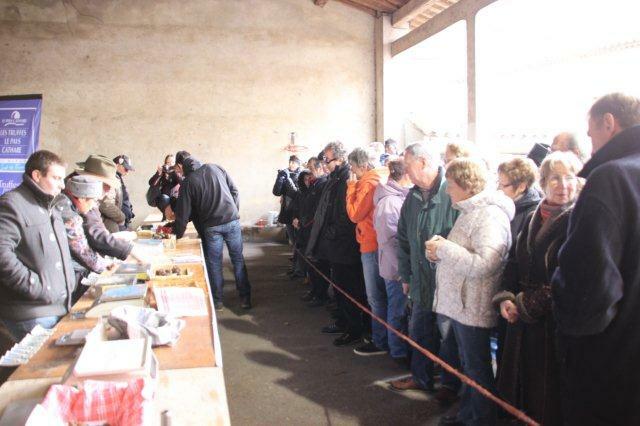 The old schoolyard proved to be a perfect place, as there was a big shelter by the side of the school building, where the long table for the trufficulteurs had been set up. 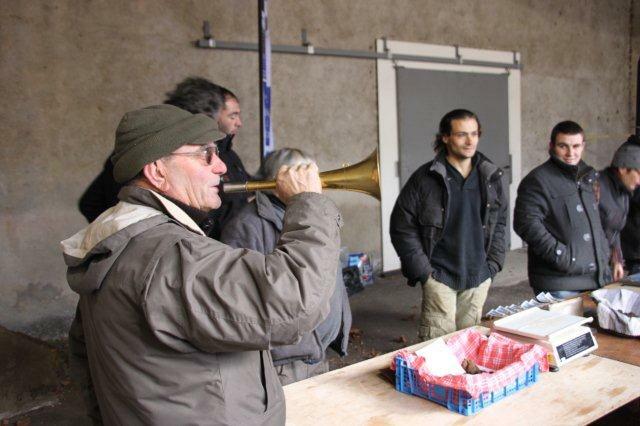 A few stalls selling local products (honey, wine, saffron, lavender essences, charcuterie, etc) were dotted about the yard, and those hardy souls were doing brave battle with the elements. 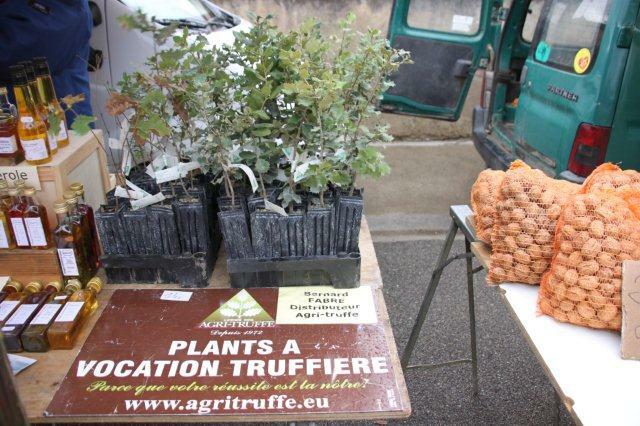 If you have the space and inclination you can buy truffle trees, which might produce some tubers after about eight years! But I’d come for the truffles and so I bypassed the rest and went to where a few people were huddled around a small table. 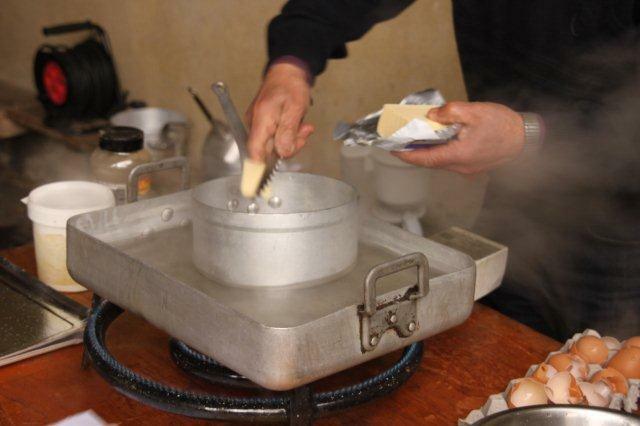 And that’s where I got my first whiff and knew we were cooking with gas! 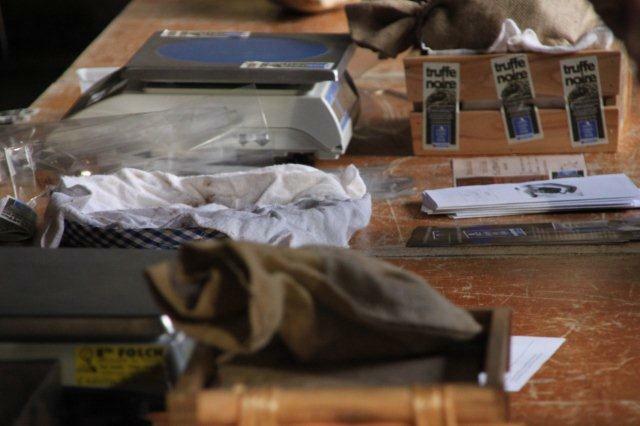 A bare wooden trestle table, an electronic scale, a plastic box, and a man with a knife. It turns out that the man with the knife is the commissaire, the official in charge of quality control. 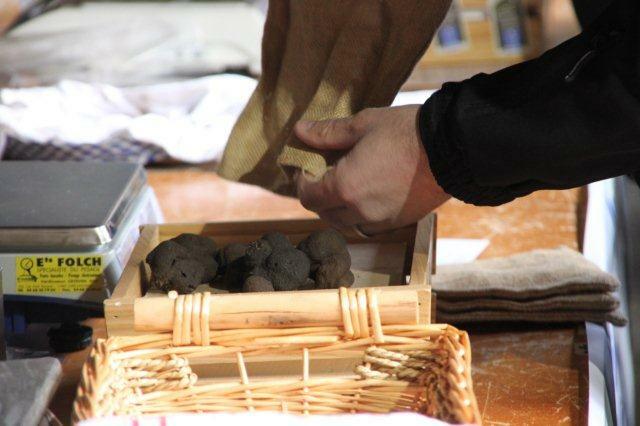 The producers bring along their stash, and he carefully examines every truffle. 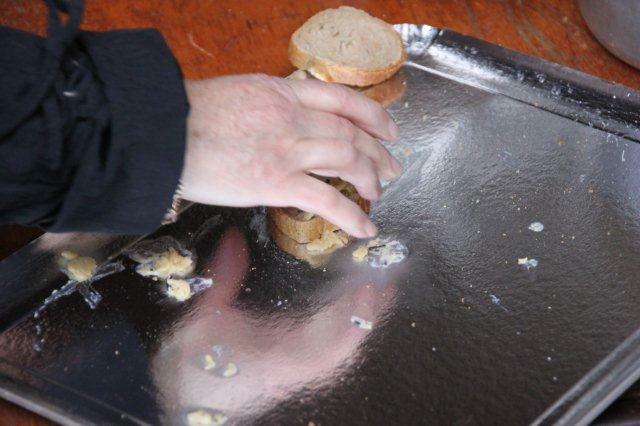 Cuts off a slice here and there to see if it’s ripe and ready, and gives it a sniff, before placing those truffles which pass the quality test onto the scales. The white marbling is a sign of ripeness and the smell is a good indication too. 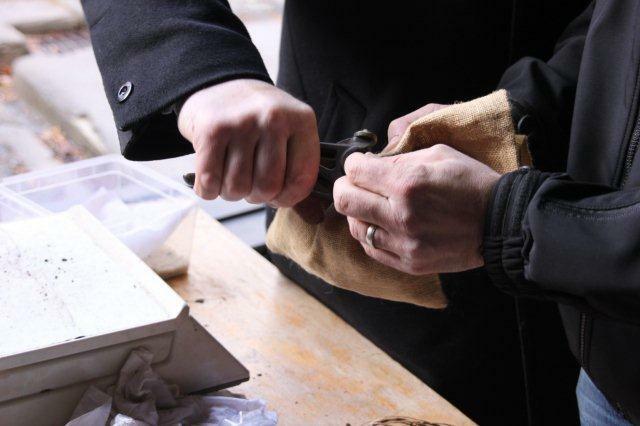 He’ll cut off bits which are overripe or not ripe enough, they’ll end up in the box, and perhaps in the trash? 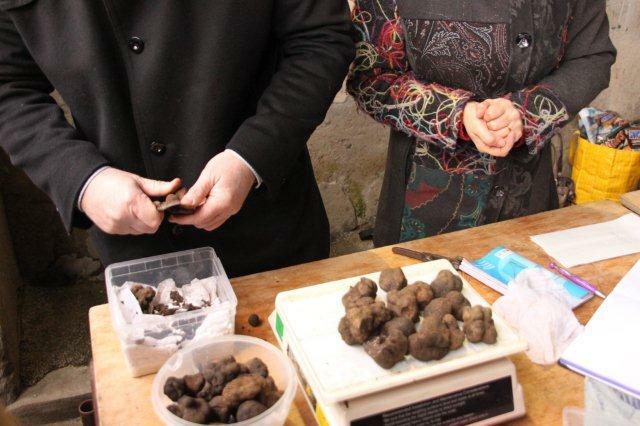 His adjudication is fair and final, he’s a kind of god of the truffles, sitting in judgement and assuring that the public which come to buy do not get any counterfeit or sub-standard tubers. 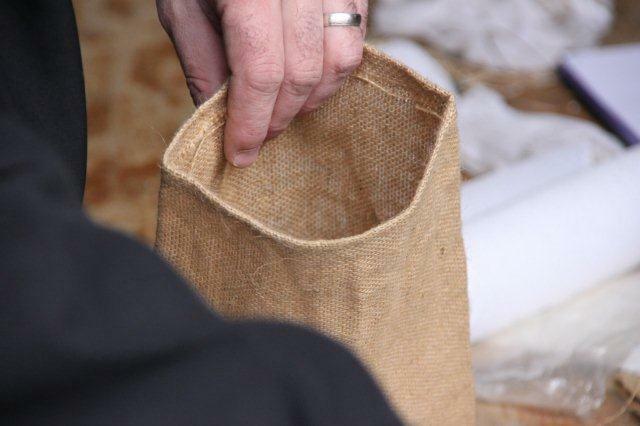 For at a mere 1000 EUR a kilo a little bit of unscrupulous dealing could earn a fair bit of extra money! 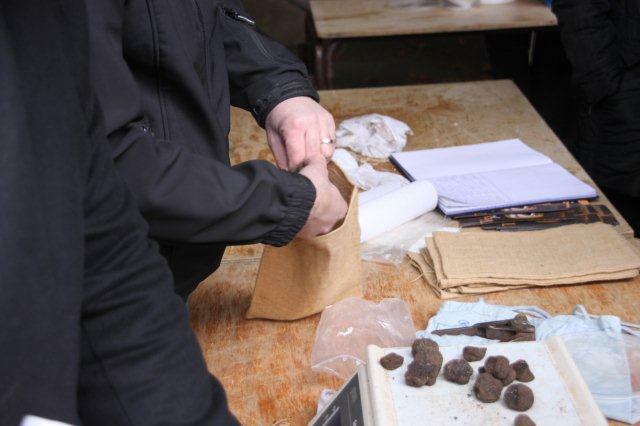 Once the truffles are graded and weighed, they go into hessian bags, and the bags are then closed with a lead seal and handed to the producer, who takes up position behind the long table. The grading goes on until about 10.40am. 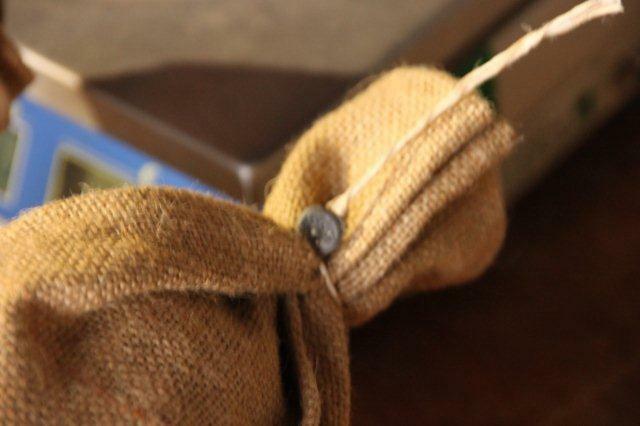 The sale is due to start at 11am and a rope is now strung about 1m from the table to keep the eager buyers at bay. 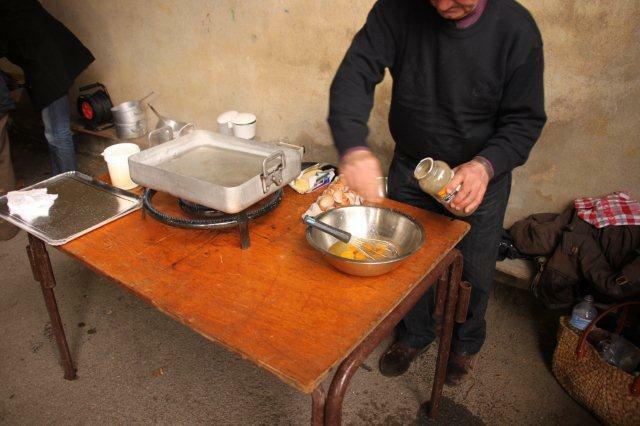 Meantime at the other end of the shelter an older gent is standing behind another table, preparing what promises to be a treat. 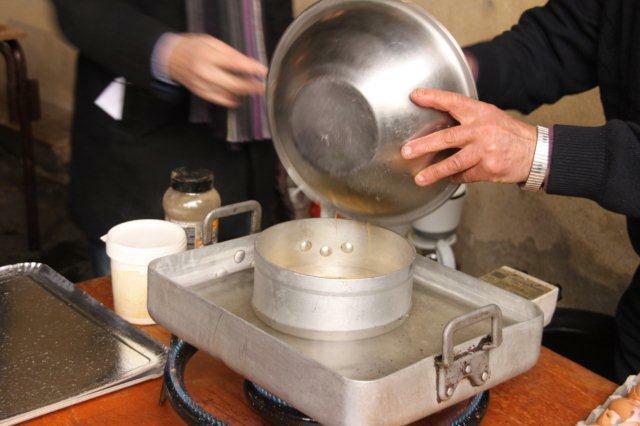 On a gas burner, the kind usually used for paella, he has a bain marie simmering away. To the side he’s just about breaking eggs into a bowl. 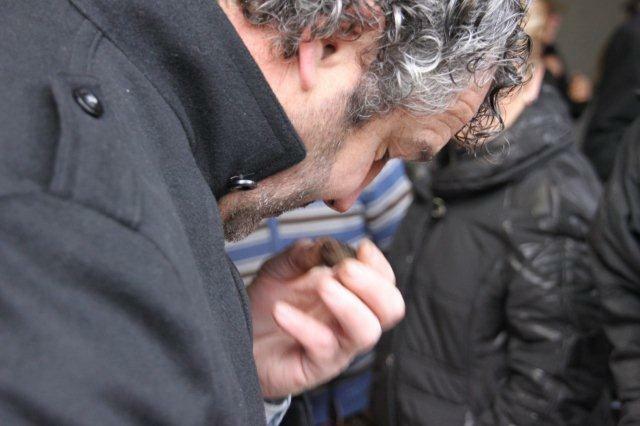 A little salt and pepper, and then the treat – a generous grating of fresh black truffle!! 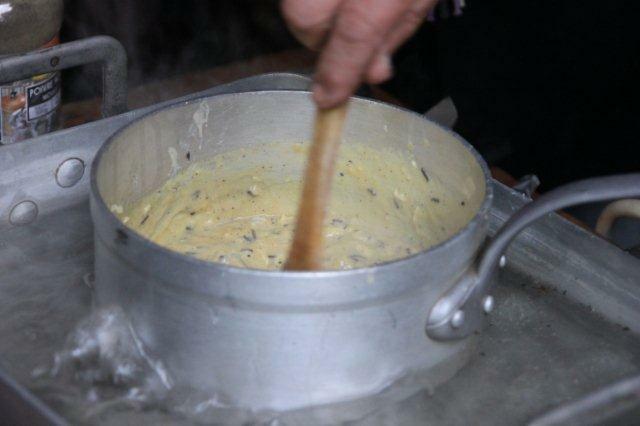 All beaten up, and poured into the saucepan which stands in the bain marie, along with a nice lump of beurre demi sel, which has been left to infuse in a hermetically sealed box with a truffle for two days. 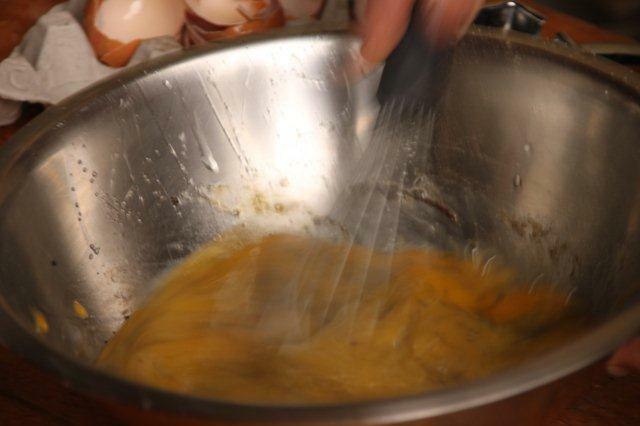 The whole is now stirred until the eggs are a creamy scrambled consistency. 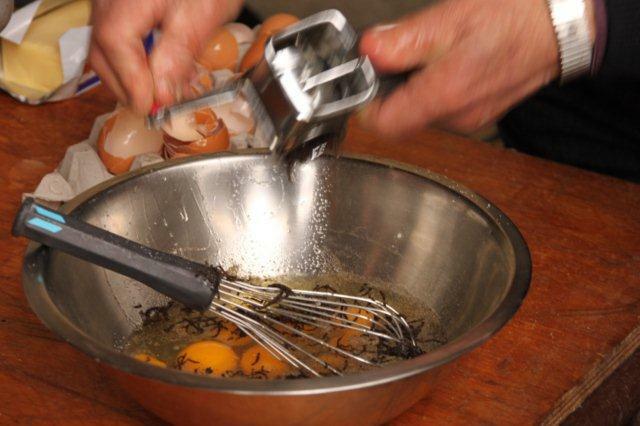 And then a little spoonful of scrambled egg is put onto slices of fresh bread and everyone is allowed to have a taste – heavenly!! 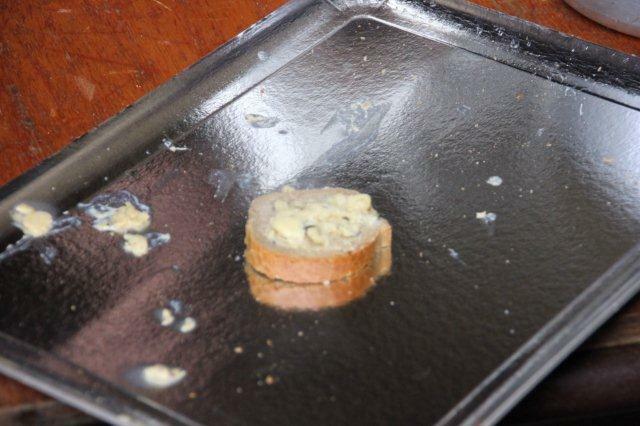 I can tell you that the pieces of bread disappeared as soon as they were put down! Meantime, we’re getting close to the start of the sale. 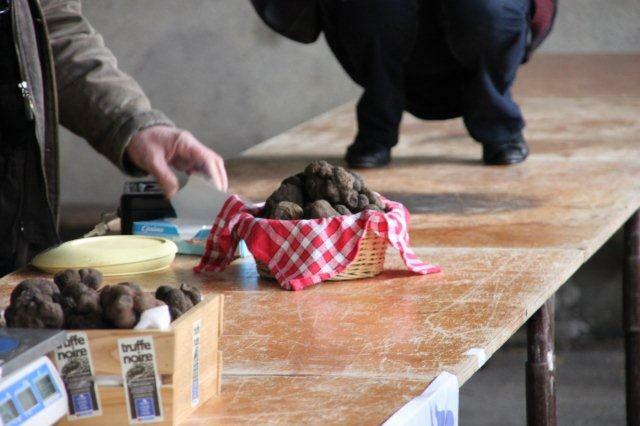 The commissaire and his helper now go along the table, opening the bags and putting the truffles out in front of the growers in full view of the waiting crowd. 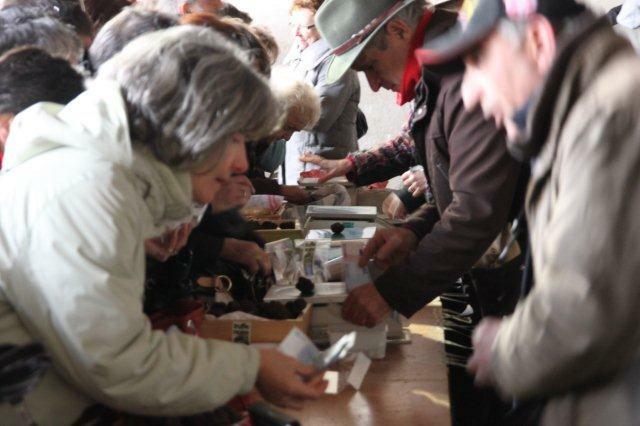 The mayor of Talairan arrives and declares the market officially open with four blows of the bugle, the rope is dropped and there’s a big surge to the table followed by a great deal of excitement, money changing hands and happy smiling faces on both sides of the table. 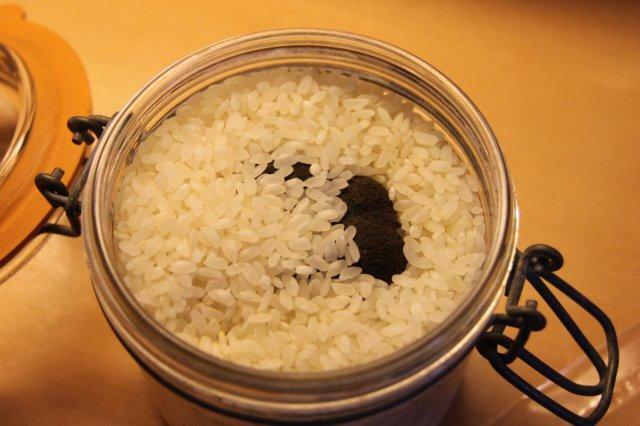 I came away with the small truffle in the bag, which weighed 21 g and cost 20 Euros – it’s been put into jar of rice in readiness for a truffle risotto. 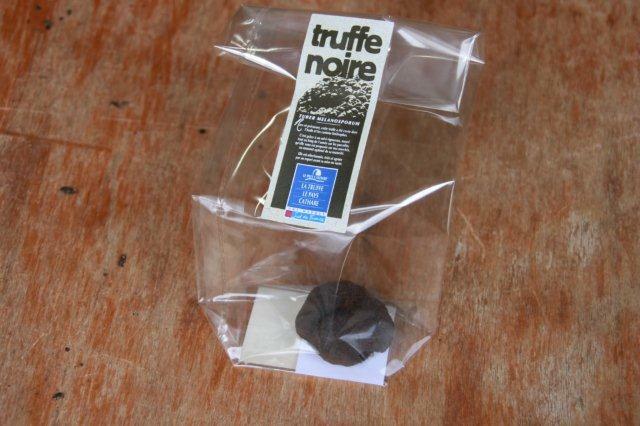 On the way home the whole car smelled of truffle, and every so often I open the jar and give it sniff. I’m sorry that this is not a scratch-and-sniff post, I wish you could experience that amazing smell! 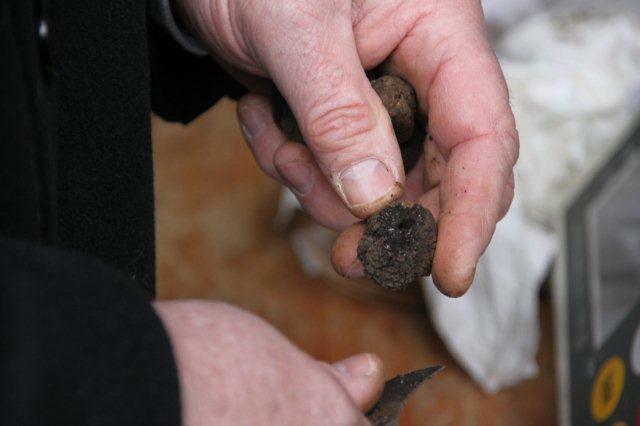 So hard to describe, but once you’ve smelled/tasted real black truffle you know what I mean. 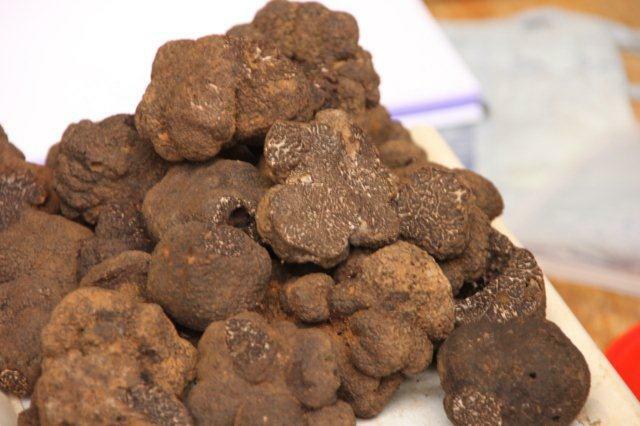 This entry was posted in Cooking, Days out, Fetes, Food, Travel and tagged black diamond, black truffle, corbieres, languedoc, mache aux truffes, scrambled eggs with truffle, southern france, talairan, truffe noire, truffle market, truffle oak, truffle risotto by midihideaways. Bookmark the permalink. What a great post, I love these types of markets! 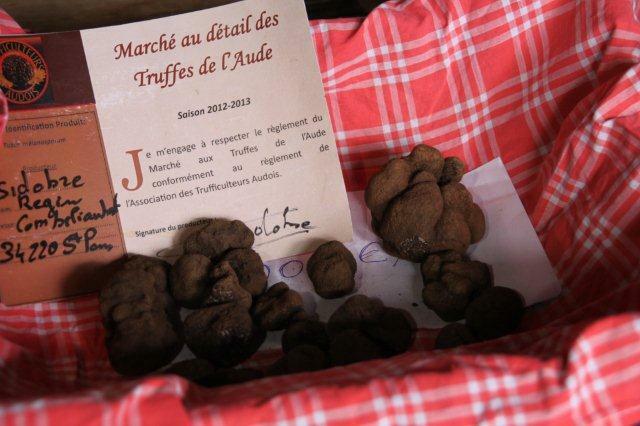 Particularly the pomp and circumstance around the truffle. What a great post and pictures! 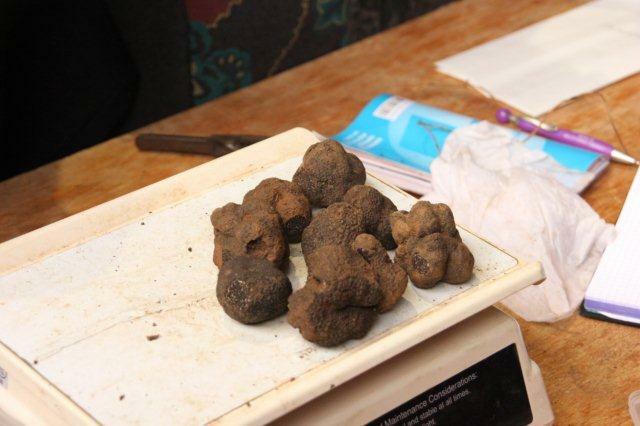 I realized I have never seen black truffles before. 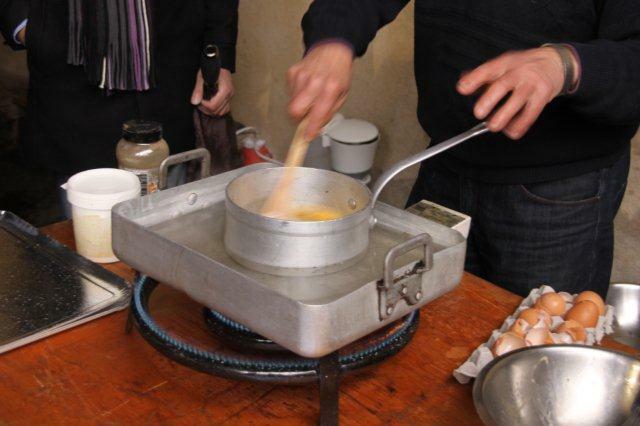 Next time we are in Aude, I will try to catch the market day. 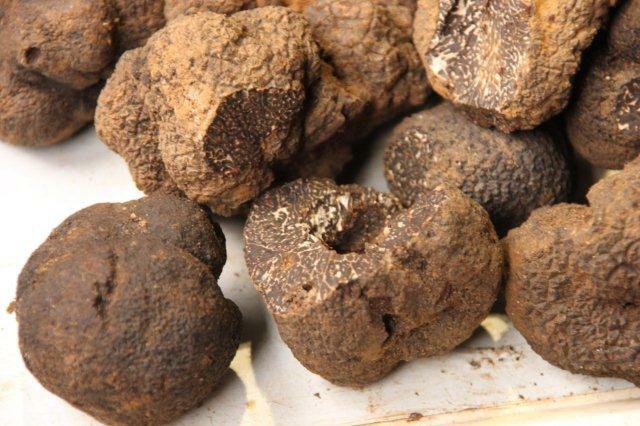 Any advice on when / where to go truffle shopping? Ok, I will probably buy just 1, like you did, to do the rice 🙂 🙂 Pictures are awesome! Thank you for posting. Glad you enjoyed the post – I really enjoyed doing the research 😉 and the writing. 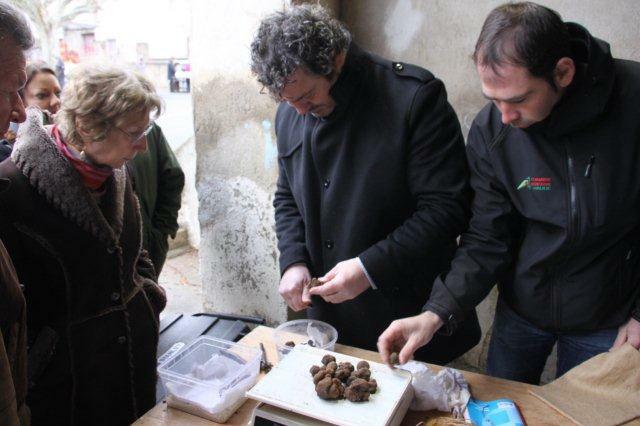 In the Minervois the truffle markets appear to have finished for now, but there should be one at Cabrespine on July 28, 2013 (Truffes et Patrimoine). 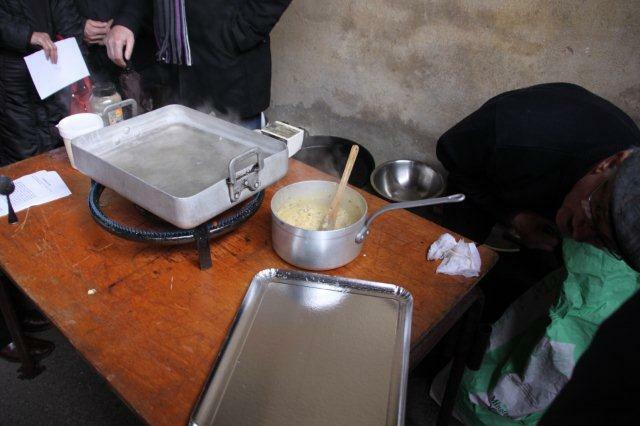 The earliest this season was on December 15, 2012 in Moussoulens. 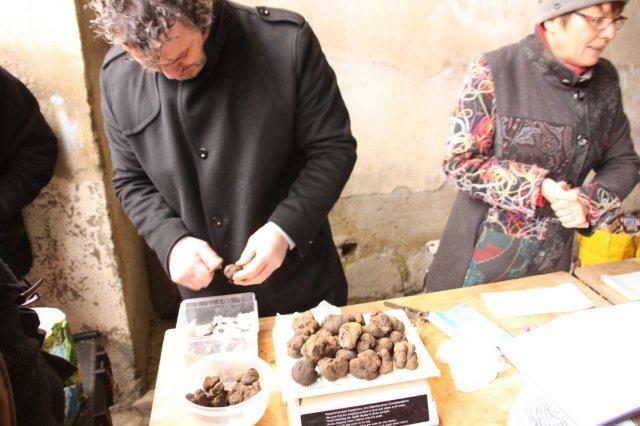 You can find out more on http://www.aude-truffes.com, and I’m sure there is the equivalent for Herault. 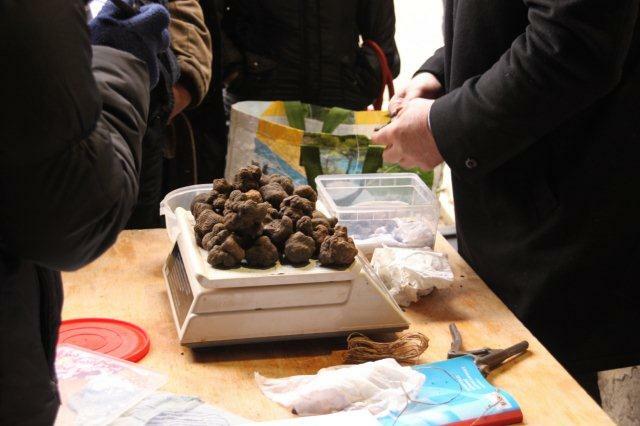 Happy truffle hunting and eating! Thank you so much for the information! This is one of the trips I would like to make this year. Thank you! I dug one up in our flowerbed last February! It stank out the fridge and we gave it to our local hotel. Great post! I wish it was a scratch and sniff post! 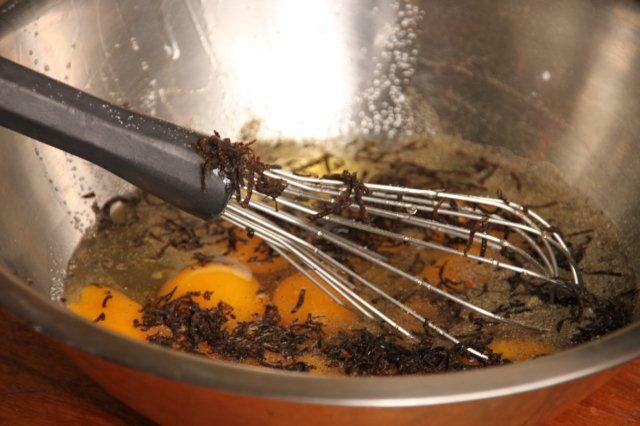 I would love to do this – one of my all time favourite ingredients, sadly kept alive these days only in my memory. yes, scratch and sniff would be absolutely wonderful for a post like this!! 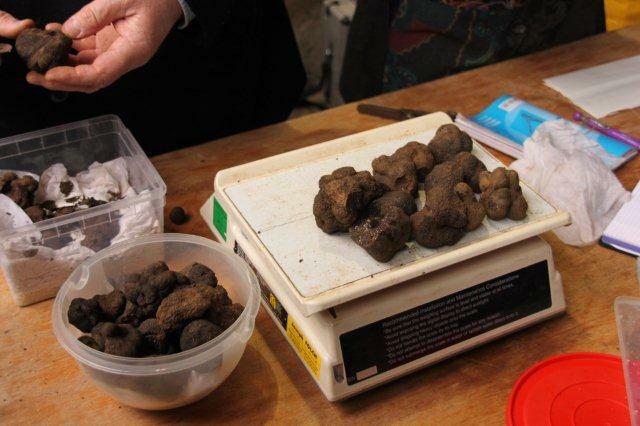 I always thought real truffles were prohibitively expensive, and yes, to a certain degree they are, just like saffron, when one looks at the price per kilo. 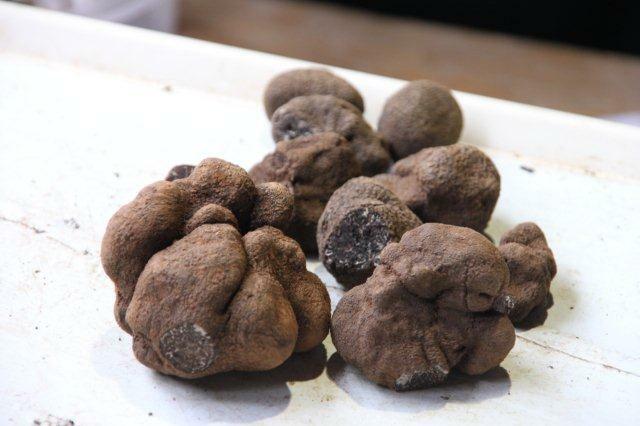 But I’ve been able to get some great results from a small truffle worth 20 EUR – guess it’s a trade off, a really nice roast could cost the same (in France that is!). What an interesting post, and great pictures! 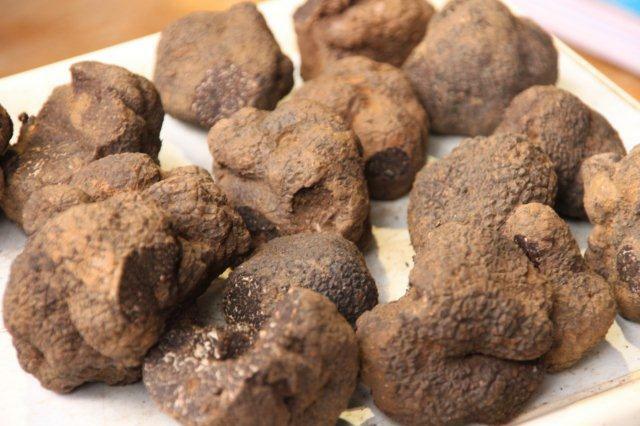 I enjoyed reading this, Ive yet to experience truffles! What a great post! I learned so much. Thanks for sharing! Hi Kasha, glad you enjoyed the read and thanks for stopping by! Hi Alanna, thanks so much for your kind comments, I hope you’ll enjoy future posts!